Over the past year, we’ve been focused on laying the groundwork to help change the trajectory of Memphis. We’ve strengthened our economic development efforts, added seasoned team members to our talented staff and we’ve focused on evaluating the tools we use to communicate not only to our members and the local business community, but to the world about what the Greater Memphis region’s business community has to offer. Last spring, we began meeting with stakeholders in the business community and in the public sector to discuss a vision for how to change the conversation about our city and help show not only our local community, but the world that Memphis is a great place to do business. We began sharing the story of our city’s momentum. Those conversations last spring really took hold – in fact, today you’re starting to hear about the momentum in Memphis at every turn. Whether it is site selection magazines calling our city the next Austin or the Mayor touting our city’s momentum to leaders across the state and country, we’re focused more than ever about where our city can go. To that end, we’ve retired the Chamber’s quarterly publication, Crossroads, because we believe our city is moving full steam ahead and we’ve got momentum on our side. The inaugural issue of Momentum highlights some of the industries we believe will drive the region’s economy as we enter our city’s third century as well as the $19 billion in new and planned investment underway in our city. There’s a recap of our first State of the Economy event as well as a look at how our strong tourism industry is driving dollars into our city. This and each issue will also highlight Member News, New Hires and feature insights from our city’s thriving entrepreneurial hub, Epicenter. While our city has its share of challenges, we believe there is much to celebrate and we look forward to telling the stories of our city’s strong business climate. Thank you for reading the inaugural issue of Momentum. Interested in being featured in Momentum? Click here. Want to raise your brand’s profile and reach the most influential group of business leaders in the region? Click here for details on advertising in Momentum. 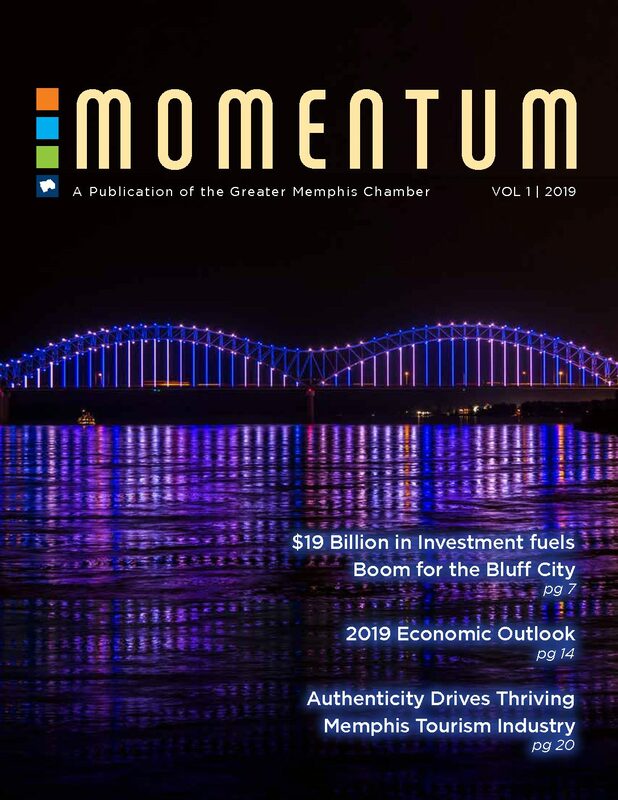 Check out the inagural issue of Momentum, featuring an overview of some of the industries that are driving the Memphis economy into our city’s third century, a recap of our inaugural State of the Economy event, a look at our region’s booming tourism industry’s impact on our economy, Member News, New Hires and more. Looking for a story from Crossroads? Check the archives for issues of Chamber's retired quarterly publication below. If you’re new to the Memphis community, this guide has everything you need to know about living, working and playing in the Bluff City. View it here or purchase a hard copy. Want to advertise your business in the Newcomer’s Guide? Contact tlivingston@memphischamber.com for details. Click here to see advertising details and pricing.